Here is a piece that I just finished. I was inspired by a video I saw last week. Joe and I were at a job related training and the instructor opened the session with a short documentary about Frances Scott Key and "The Star Spangled Banner".... I was moved to the very core of my being at the sacrifices made by our founding fathers. "O, say does that star spangled banner yet wave? O'er the land of the free and the home of the brave." or BECAUSE of the brave. 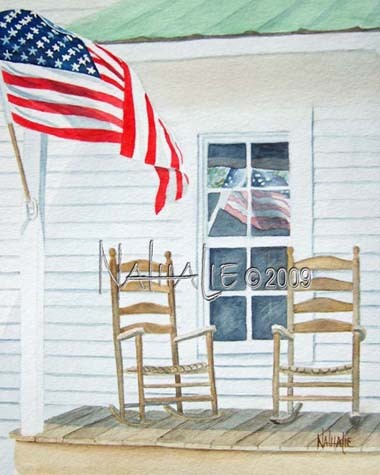 The flag is displayed on the porch with the rocking chairs. Comforting and comfortable. But let's not take our liberty for granted.